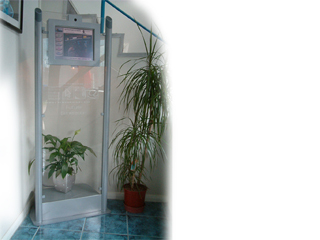 i-Touch V33 Slim-Line Glass Floor standing kiosk with 15'' screen - Future Generation Kiosk Products. As shown, the rear shelf is ideal for demonstrating products or offers, or you can simply enhance the aesthetic appeal by using decorative items such as a pot plant. Please note that the pot plant is not included.Dimensions: 600(15 inch)/650(17 inch)x1600x305 mm (WxHxD). Weight: 54kg.